If you’re seeking one of the most stunning landscapes in the universe that is beautifully carved from nature and lets you feel as important as the surroundings you’re in, then Red Rock Canyon is the ultimate stop. The Mojave Desert is noted for its magnificent red rock formations tinted red by iron oxide. There are even dinosaur tracks created many million years ago and exotic Joshua trees and desert plants. From 2 to 50 guests, a Red Rock Canyon wedding delivers intimacy and your own piece of the desert. Red Rock Canyon National Conservation Area isn’t far from the famous Las Vegas Strip. If you’re dreaming of an outdoor wedding ceremony that truly “rocks,” we offer the finest, affordable Red Rock wedding packages around. Our wedding company proudly knows the desert area like the back of our hand. We have joined numerous happy couples in matrimony and found exceptional spots for your outdoor wedding. Ash Springs is one of these elegant backdrops. Red and white sandstone cliffs located at the Calico Basin offer striking views at every angle. It’s a desert paradise that creates magical moments in photographs. Red Springs promises another must-see view of the spectacular Calico Basin. Its charming, wooden boardwalk fits right in with the natural beauty of the region and creates the kind of private spot for intimate gatherings. (Red Springs is under construction as of June 2018 and currently unavailable). Overlook is calm, as beautiful as a painting and protected by the Bureau of Land Management. Red Rock Canyon weddings are made of majestic mountains with layers of brilliant color and incredible sunsets. Amphitheater at Red Rocks Park (in visitors center) is another fine example of our destination weddings. There’s plenty of room to design your ideal wedding ceremony in a rustic, country atmosphere. 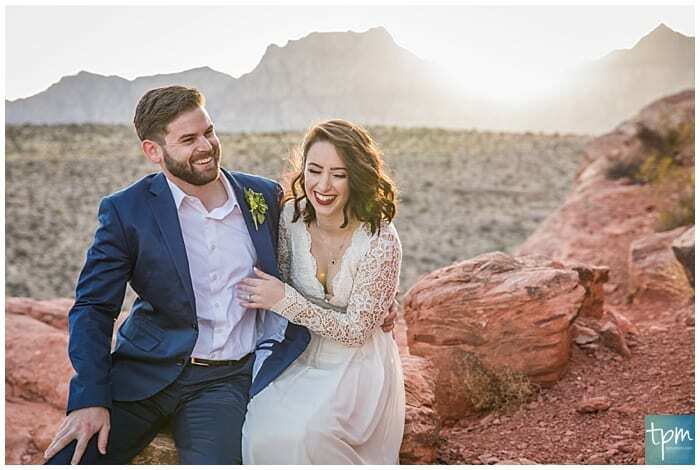 The Mojave Desert gets very hot, but other ceremonies cannot compare to our unforgettable Red Rock Canyon weddings, and you can work around the seasons. Spring is the most popular time of year for eloping in Vegas. All is abloom with colorful wildflowers and crystal-clear skies. Temps are coolish and comfy. Summer is still desert-lovely, but the blistering heat can soar above 100-degrees. Bring enough SPF protection and water. A summer sunrise wedding is always nice. Fall is the other popular season for getting married. The desert foliage is changing colors. It’s delightful with comfy temps for eloping. Winter sunsets at Red Rock Canyon are picturesque and quieter. Still, marrying in winter is appealing, and temps hover around the low 50s. There are some rules involved with an outdoor wedding, but you don’t have to worry. We’re experts at destination weddings and always follow the law. For example, there are only 15 annual permit holders for weddings in Red Rock Canyon. We’re well-respected in the industry, so we have possession of a commercial wedding permit. Choosing us gives you the freedom to get married at this impressive canyon. Red Rock Canyon National Conservation Area and the Bureau of Land Management are protective of the scenic desertscape resources. We promise that boredom doesn’t exist at Red Rock Canyon, and in between saying your “I dos,” there’s plenty you can immerse yourself in. There is always the natural outdoor beauty to explore along with exquisite dining, nightlife and chilling out. Red Rock Canyon is a treasured gem in the playground of Vegas. Red Rock Casino is located about a 30-minute drive from the Strip. The beautifully-designed hotel boasts the best buffet in Vegas and fine eateries like the Masso Osteria and T-Bones Chophouse restaurants. Entertainment is king with live music, concerts, gambling, bowling, movies and more. Features non-stop fun in a huge outdoor mall with 125 stores, restaurants and entertainment. Red Rock Canyon weddings are our specialty, and we love uniting couples who seek this adventure. Allow us to do the heavy lifting. We’ll secure your wedding permit and find you the best minister, photographer and floral bouquet. Use our list of resources to book an intimate reception dinner for your guests. Fill out our form below to get started with your personalized quote.